Are you a Veteran who would like to give back to your fellow Veterans? Join the Crossroads Hospice team and visit with Veterans on hospice service in your area! Volunteers provide companionship and support to hospice patients and their families by visiting and spending time with their assigned patients. Activities may include reading, playing board games or cards, talking, singing, writing letters, going for a walk, or simply sharing stories. 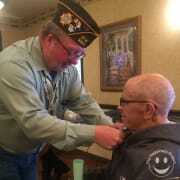 We also encourage you to participate in our Veteran Pinning Ceremonies! We work all over Northeast Ohio, going to wherever the patient calls home (private house/apartment, nursing home, assisted living facility). We strive to keep our volunteers within a 15 minute drive from the patient(s) they visit - so you can volunteer right in your local community!